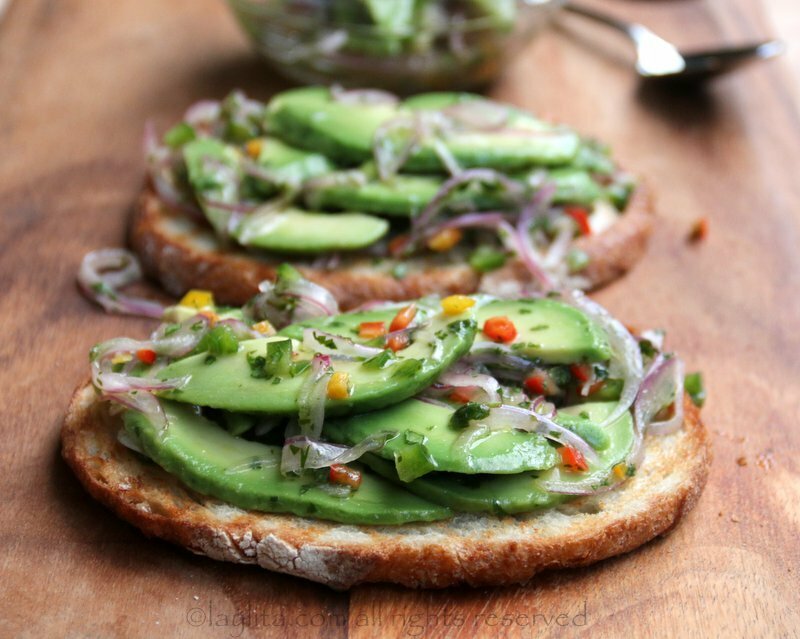 This is my recipe for avocado crostini or avocado bruschetta; it is made with toasted or grilled garlic bread, avocado, onions, hot peppers, lime, olive oil, and cilantro. Have I mentioned before how much I love avocados? 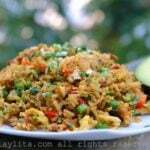 I could easily add avocados to breakfast, lunch, snacks and dinner. 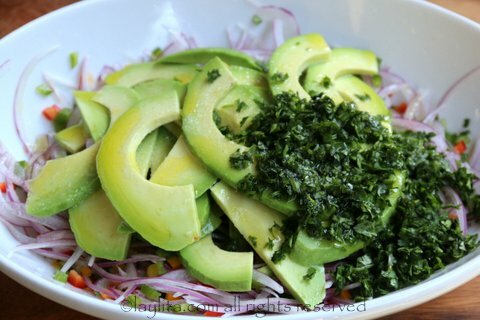 I would even trade dessert for a perfectly ripe avocado sprinkled with salt and lime juice. 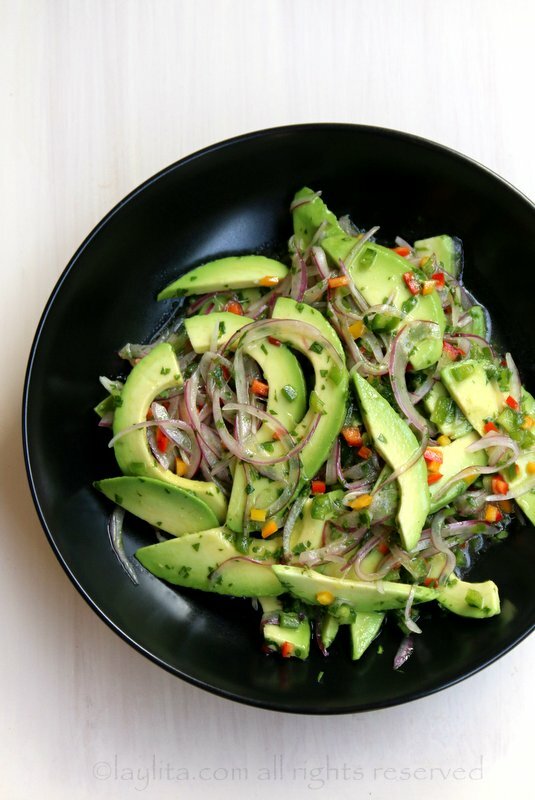 One of my favorite ways to add avocado deliciousness to most meals is by serving a chunky avocado salsa as a side or topping. Recipe for avocado crostini, a delicious avocado salsa bruschetta served over garlic crostini or toasted garlic bread slices. Use an indoor grill (the Panini style ones are perfect) to grill or toast the bread. You can also use an outdoor grill, griddle pan or a frying pan (very lightly greased with butter or olive oil). Rub the grilled or toasted bread slices with the garlic clove, this is optional – but highly recommended if you’re a garlic lover. Save the crostini bread slices until ready to use. 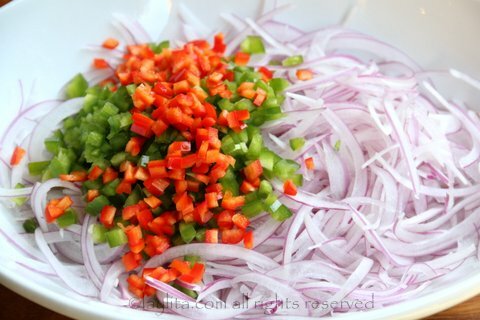 Sprinkle the onion slices with salt and rinse well with cold water. 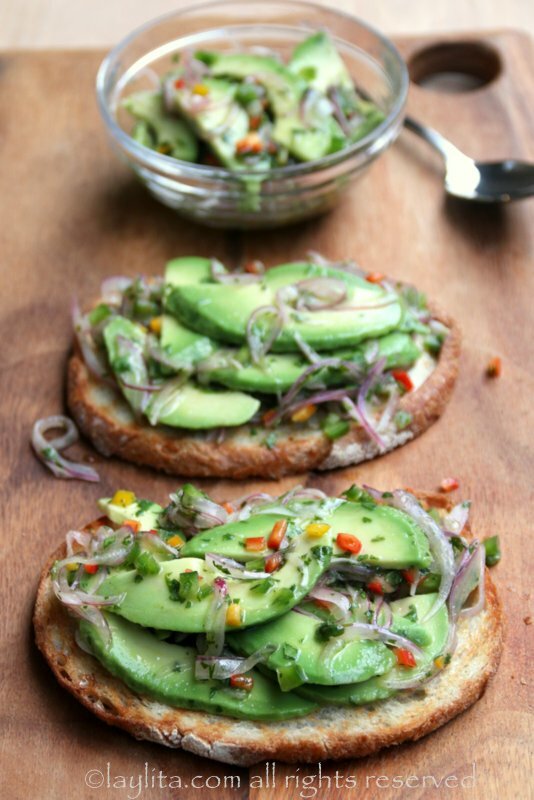 Place a generous amount of the avocado bruschetta salsa on top of each piece of crostini or toast. Serve and enjoy! 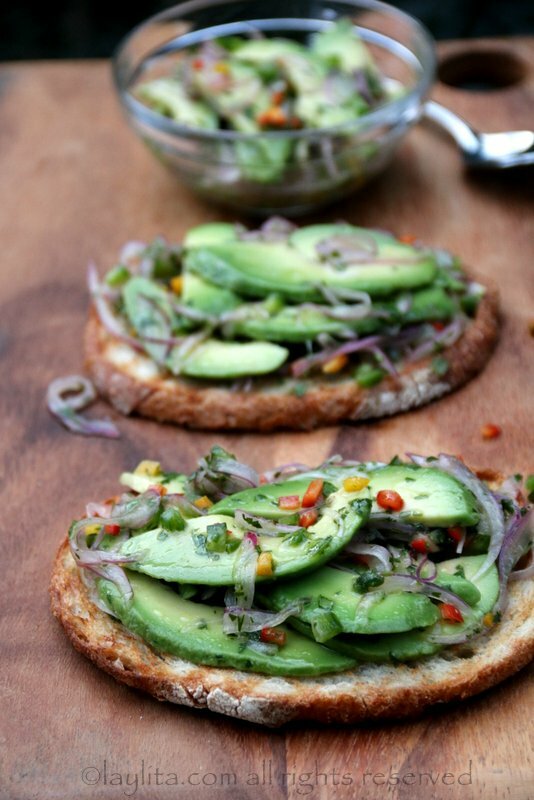 Avocado on toasted bread is one of my all-time favorite snacks. I usually just smear crushed avocado onto a piece a bread, add some salt and done. This time I used my avocado salsa as a bruschetta or crostini topping over grilled garlic bread. It was heaven! 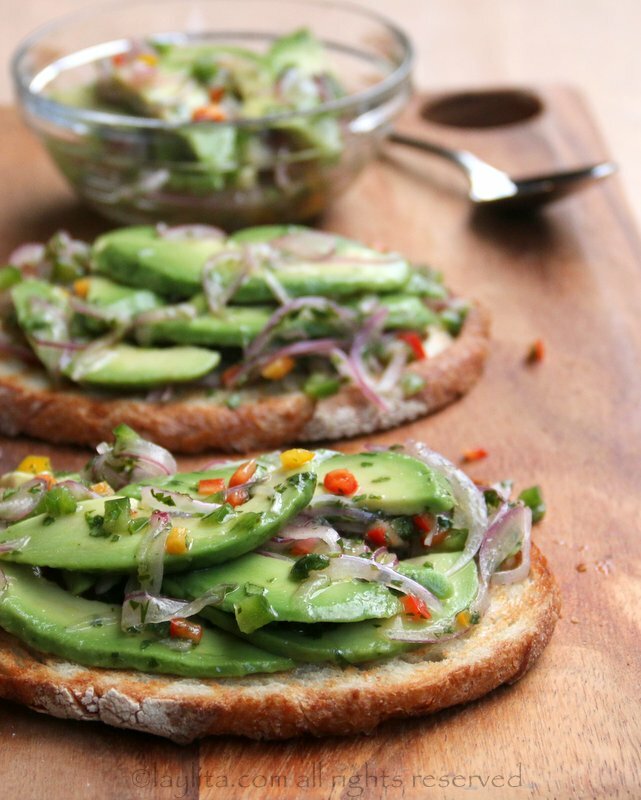 This avocado crostini is super easy to make and makes a great snack or appetizer. 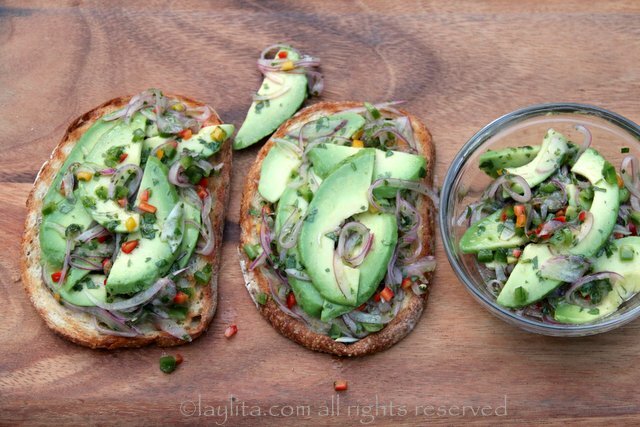 Both the grilled crostini and the avocado bruschetta salsa can be made ahead of time or right before serving. But I think I added too much lime juice because it’s really overpowering- any suggestions on what i can add to balance it? 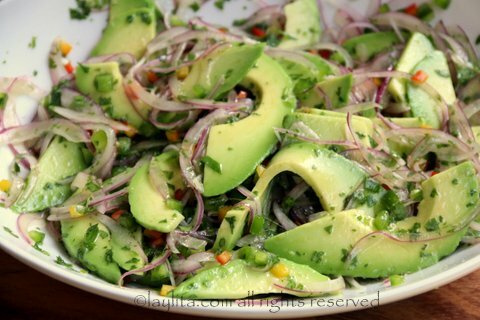 You can try mixing in an ice cube, this will help mellow down the acidity (I haven’t tried it with this recipe, but it’s what is done for dishes like ceviche when the acidity is very strong). 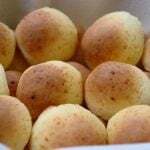 I love it, thanks so much, delicious !!!!!! I just stumbled over your Website while looking for a new Pasta recipe last week. I was reading the “Gavin’s special pastas” Story and in the meantime all other recipes. 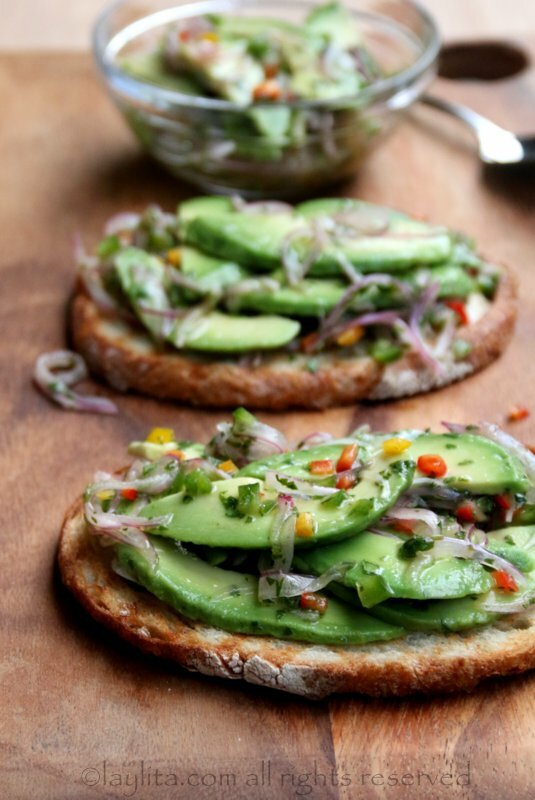 Yesterday I made now as first the Avocado Crostini in the company, everybody loved them, just great. do you mean red/green bell peppers? I used a mix of jalapeños and red chilies since I like it spicy, but you can also use the small sweet peppers (or bell peppers) if you prefer.